The week that was has been a completely off the wall. The exact opposite of normal. Now, as you all know, this is entirely Marcia’s fault. Left to myself I would live a perfectly reasonable in which nothing ridiculous happened and life would be staid and proper. Not when you live with the company I keep. We are in the very early stages of a new book revealing itself. Whispered conversations only partly heard, shadows with figures who dissolve when you turn to look at them and feather-light touches on the shoulder. Thoughts of plots fleet past, leaving behind the thought that they are utterly silly, impractical, risible even. Meetings between characters are seen – but are they true or is this one of those convenient but unlikely coincidences much favoured by story tellers? Everything is very vulnerable and fragile: it is all very frightening and we know from bitter experience how difficult it is to hold onto these fleeting impressions and there are two ways in which they can be utterly destroyed. The first is to talk about them. In fact Marcia refuses to mention any of her ideas to anyone apart from me and even then there comes a moment when the discussion turns from being productive to utterly destructive. Now, after thirty books (including those she wrote as Willa Marsh) we both recognise the signs and change the subject in time. It was not always so. There have been quite serious problems when, usually thanks to talking too much, something that would prove to have been very important indeed is put aside. Only when the book is nearly finished does Marcia realise that a certain strand or even character glimpsed in the early days and then ignored has to be brought on board. The last time this happened, this character made a ‘first appearance’ in the first chapter and had to be woven into the whole book so that the seams were undetectable. It says much for Marcia’s professionalism that only two people knew anything about this: her agent and me. Nobody else noticed but that was thanks to weeks of hard work and so this time (we always say this) we are determined not to let it happen again. The second is that intrusive force that cannot always be ignored that some call real life (but which, to Marcia at least, is the opposite – her places and her characters are far more real to her than what goes on around us). Last week ‘real life’ forced itself upon us. This again was all Marcia’s fault – Wednesday was her birthday and all of her friends wanted to have a part in that and I include here all those who so kindly wished her well on Facebook. 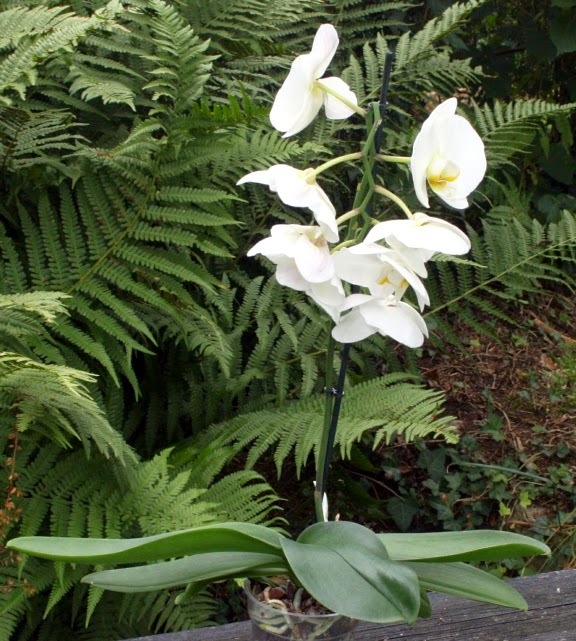 Probably the most exotic floral tribute was from one of Marcia's nephews who sent her this wonderful orchid. They are supposed to be very long lived but with our track record when it comes to pol plants . . . The strange piercing noise that her mobile makes when it received a new text filled the air from first to last, people kept arriving with flowers and the sun shone. 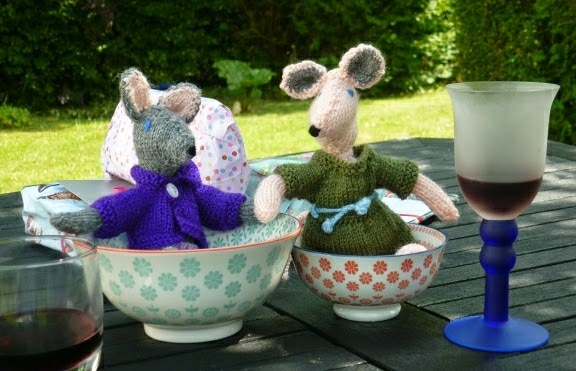 So it was that we found ourselves sitting in the sun, two glasses of wine to hand, as Marcia opened her present including two knitted mice (about which I refuse to comment – the photo is all you need other than we understand that one is called Quentin and the other Clemmie). Unfortunately her sister Bridget was unable to come down for Marcia’s birthday as her husband had a hospital appointment on that day (he will be having surgery on a knee early in October) so they arrived to spend yesterday with us. Luckily the sun shone on Dartington and we had lunch outside the White Hart. 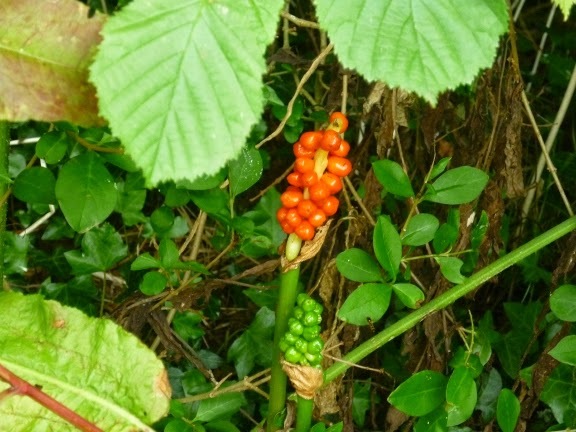 Arum maculatum, otherwise known as Cuckoo Pint, growing in our garden. These berries are extremely poisonous as they contain oxalates of saponins which are, or so I am reliably informed, amphipathis glycosides. I felt your week would be incomplete without this information. Anyway, guzzling these attractive fruits in excess will certainly land you in hospital so it is fortunate that they don’t taste very nice. All of which meant that for two days Marcia had to turn her back on those whispers, shadows and other revealings. It would have been worse had Tuesday not been a very productive day and now, as I write, she has drifted off to her own particular Narnia to pick up where she left off. 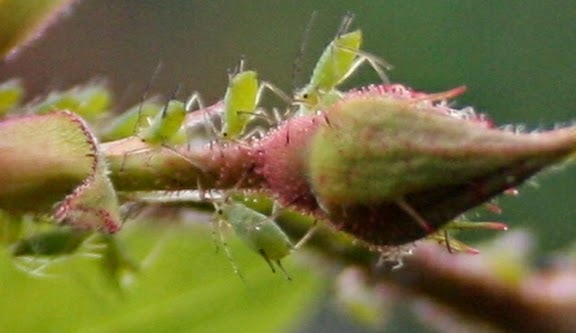 Also in the garden, the lovely old rose that clambers over the fence from next door has been attacked by these voracious little fellow. Heads down sucking all the goodness out of the plant. Sorry, little greenflies, you will have to go. Only two problems with life next week. One of our favourite charities, the Rowcroft Hospice which runs hospices here in the south west of England, is running a ‘book sale’ week in order to raise funds and various authors in the area agree to give talks and to meet and greet people in the shops the charity runs. On Tuesday, Marcia will be in their Totnes shop from 10 am to noon and is looking forward to meeting any of her readers who happen to be in the town on that morning. The other is that the man calls on Friday to service the boiler. Essential if Narnia is to be warm this coming winter. 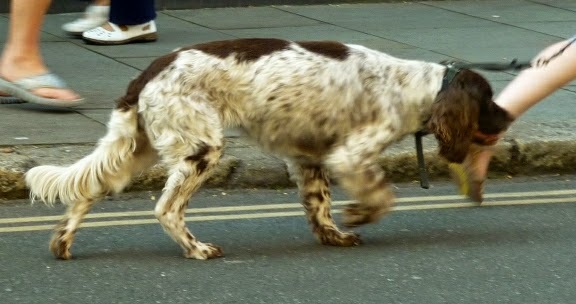 I shall fill in those two hours taking a few photographs of dogs for the blogs. Stocks are running down. See you next Friday. I can't tell you how much I hate going shopping!